My choice of this sign for recreation was mainly inspired by news that a third Bill and Ted movie would at long last be coming out in the not too distant future. This sign’s only complete word “station” probably indicates a nearby Rocket Tram Station on the planet Corellia and is not a reference to martians with excellently huge butts. Probably. 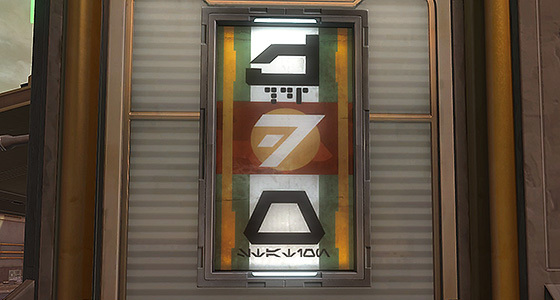 The sign’s basic design is similar to others in the game, contains one readable word, three seemingly random letter and three seemingly random numbers. But how random are they? If there is one thing I’ve learned working on this blog is that things are often not as simple as they seem. The top and bottom letters are translated easily, but there is something going on in the middle of the poster. 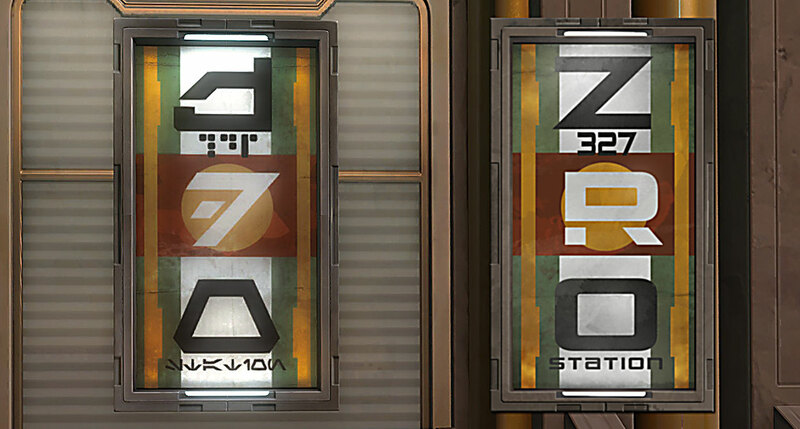 At first glance the large letter in the center seems to be Dorn, the Aurebesh letter for D, but the artist’s choice to slice through the second horizontal bar changes the letter shape into Resh, the Aurebesh R. This suggests to me the intent to combine the two shapes into a single unique glyph. In my recreation I attempted a similar effect by slicing off the lower legs of the R to create a shape that evokes both D and R.
Could the Z, DR (Doctor) and O refer to some of the founders of Bioware? It seems plausible to me. But stare long enough at any random arrangement and patterns will emerge. Moving on, the numbers 327 on the sign are fairly common throughout Star Wars lore. I’m sure numerologists could have a field day with George Lucas’ recurring use of numbers. 1138 is the most famous of his favorites, but it’s far from the only one. 327 appears in American Graffiti, A New Hope, The Empire Strikes Back. As for what it means, your guess is as good as mine, but 327 is apparently a “perfect totient number.” Even after researching that term, I still don’t have the slightest clue what it is, but 327 was also the street address of the house I grew up in as a child.